This gene encodes glucocorticoid receptor, which can function both as a transcription factor that binds to glucocorticoid response elements in the promoters of glucocorticoid responsive genes to activate their transcription, and as a regulator of other transcription factors. This receptor is typically found in the cytoplasm, but upon ligand binding, is transported into the nucleus. It is involved in inflammatory responses, cellular proliferation, and differentiation in target tissues. Mutations in this gene are associated with generalized glucocorticoid resistance. Alternative splicing of this gene results in transcript variants encoding either the same or different isoforms. Additional isoforms resulting from the use of alternate in-frame translation initiation sites have also been described, and shown to be functional, displaying diverse cytoplasm-to-nucleus trafficking patterns and distinct transcriptional activities (PMID:15866175). There are 532 articles specifically referring to this gene in PubMed. Functionally, the gene has been tested for association to diseases (Adenoma; Adrenal Gland Neoplasms; Adrenocortical Hyperfunction; Arthritis, Rheumatoid; Asthma; Breast Neoplasms; Bronchial Hyperreactivity; Bronchiolitis, Viral; Cardiovascular Diseases; Cholesterol, HDL/blood* and 45 others), proposed to participate in pathways (Corticosteroids and cardioprotection, Neuroactive ligand-receptor interaction, NFkB activation by Nontypeable Hemophilus influenzae, Visceral Fat Deposits and the Metabolic Syndrome) and processes (chromatin modification, regulation of transcription, DNA-dependent). Proteins are expected to have molecular functions (glucocorticoid receptor activity, metal ion binding, sequence-specific DNA binding, steroid binding and 2 others) and to localize in various compartments (membrane, nucleus). 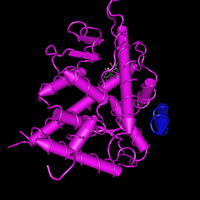 Putative protein interactors have been described (ADA, AR, ARPC5, BAG1, CALM1, CALR, CEBPA, CEBPB, CHD9, COPS6 and 95 others). Over 150 Diseases associated with this receptor. Please see HuGENavigator for more information. GR Reporter Cells are prepared using INDIGO’s proprietary CryoMite™ process. This cryo-preservation method yields high cell viability post-thaw, and provides the convenience of immediately dispensing healthy, division-competent reporter cells into assay plates. There is no need for intermediate spin-and-wash steps, viability determinations, or cell titer adjustments. The principle application of this assay product is in the screening of test samples to quantify functional activities, either agonist or antagonist, that they may exert against the glucocorticoid receptor. This kit product is an all-inclusive assay system that includes, in addition to GR Reporter Cells, two optimized media for use during cell culture and (optionally) in diluting the test samples, a reference agonist, Luciferase Detection Reagent, a cell culture-ready assay plate, and a detailed protocol. The gene contains 29 distinct gt-ag introns. Transcription produces 28 different mRNAs, 21 alternatively spliced variants and 7 unspliced forms. 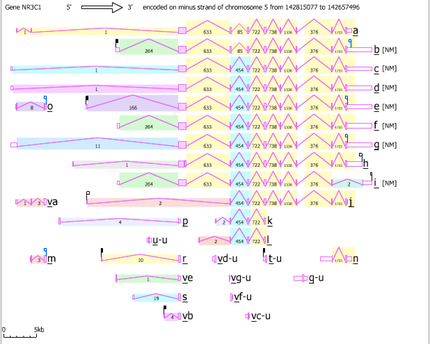 There are 13 probable alternative promotors, 3 non overlapping alternative last exons and 8 validated alternative polyadenylation sites (see the diagram). The mRNAs appear to differ by truncation of the 5' end, truncation of the 3' end, presence or absence of 7 cassette exons, overlapping exons with different boundaries, splicing versus retention of one intron. 152 bp of this gene are antisense to spliced gene gleewuby, 664 to gluja, raising the possibility of regulated alternate expression.